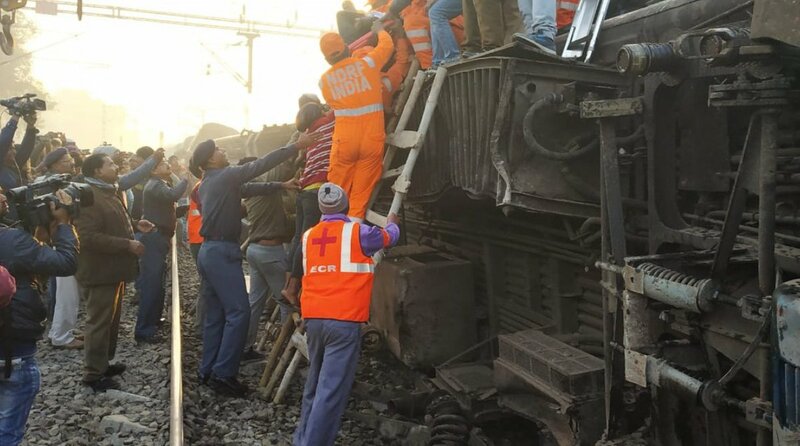 The Railways suspect rail fracture as the probable cause of the derailment of the Delhi-bound Seemanchal Express on Sunday morning that left at least seven dead and scores injured. “Prima facie cause of Seemanchal Express accident is rail fracture of CMS X-Ing at Barauni end of station yard,” Rajesh Kumar, the Chief Public Relations Officer of the East-Central Railway, was quoted as saying by ANI. The exact reason behind the accident will be unearthed after the Commission of Railway Safety (CRS) concludes its investigation into the derailment. Eleven coaches of the train went off the rails before dawn near Sahadai Buzurg in Vaishali district at a time when most passengers were deep in sleep. Kumar said that the 12 unaffected coaches are being moved to Hajipur where more coaches will be attached before the train moves to its original destination at Anand Vihar Terminal railway station (ANVT) near New Delhi. Prime Minister Narendra Modi, Congress president Rahul Gandhi and Bihar Chief Minister Nitish Kumar were among those who expressed grief at the loss of lives. “Deeply anguished by the loss of lives due to the derailment of coaches of the Seemanchal Express. My thoughts are with the bereaved families. May the injured recover quickly. Railways, NDRF, and local authorities are providing all possible assistance in the wake of the accident,” wrote PM Modi on Twitter. “Deeply pained to learn about the train tragedy in Bihar. My thoughts are with the affected families. Requesting local Congress workers to extend all possible help to the families of the affected,” Gandhi wrote on Twitter. Chief Minister Nitish Kumar also directed the state administration to provide all assistance in the rescue and relief operation. He announced a compensation of Rs 4 lakh each to the kin of the deceased and Rs 50,000 to the injured. The Indian Railways also announced that ex gratia Rs 5 lakh each will be given to the kin of the deceased while Rs 1 lakh would be given to the grievously injured and Rs 50,000 to those who have suffered simple injuries. The Railways will also bear medical expenses. Rajesh Kumar said that one general coach, one AC coach (B3), three sleeper coaches (S8, S9, S10) and four more coaches derailed between 3-4 am near Shadai Buzurg railway station in Vaishali district. The teams of doctors were rushed from nearby Sonpur and Barauni. This is the second major train derailment in two days. On Friday, the Dayodaya Express derailed between Madhya Pradesh’s Jabalpur and Rajasthan’s Ajmer near Jaipur on Friday. No passenger was, however, injured in the accident. The Prime Minister also batted for the Hindu Bangladeshi migrants in a bid to woo the voters ahead of the Lok Sabha polls that are due this May. Addressing his second rally in West Bengal on Saturday, Prime Minister Narendra Modi criticised the Mamata government for its “anti-development approach”. Addressing a rally in Durgapur, PM Modi said the ruling Trinamool Congress was not bothered about the development of the state with major projects stuck for over a long period of time. “Projects worth Rs 90,000 crore are moving at snail’s pace because of the attitude of the state government. They are not cooperating with the Centre, they have an anti-development approach,” PM Modi said while referring to infrastructure development in West Bengal. He said while the state government is busy crushing the dreams of the poor and the middle class, the Central government is trying to deliver a new flight to those dreams. He said the people of Bengal will oust and uproot the government led by Mamata Banerjee, which does not care about the dignity of democracy. The PM further said the Mamata government has strangled democracy adding that the people of Bengal will no longer tolerate anarchy. “Ruling TMC is certain to go, I can see clearly that Bengal will usher in parivartan (change),” he said. Referring to clashes on Friday night in Durgapur, PM Modi said TMC has no respect for the law. Clashes erupted between workers of the Bharatiya Janata Party (BJP) and the Trinamool Congress late on Friday in Durgapur. The clashes erupted after TMC workers allegedly attacked a BJP cadre and pulled down hoardings and banners announcing PM Modi’s visit. Lauding the BJP workers in Bengal, he said their efforts and sacrifice would not go in vain. 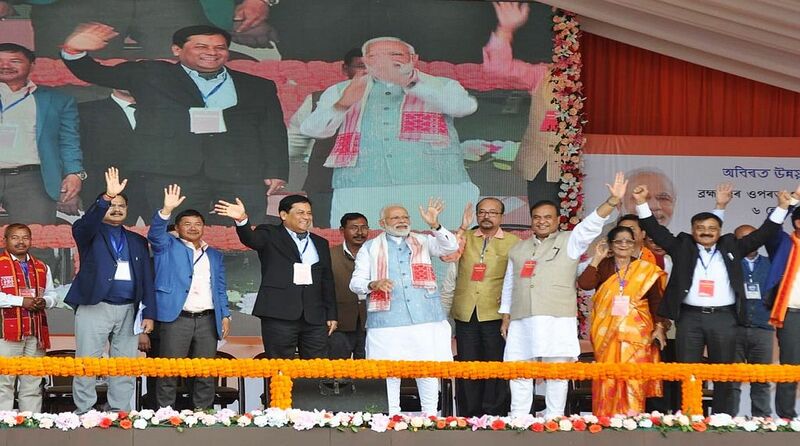 “Your fervour is giving Didi sleepless nights, and that’s why she is adopting the ways of the Left,” PM added. Lauding the Interim budget 2019, PM Modi said the budget illustrates “Sabka Sath Sabka Vikas”, adding that it was just a trailer. “The budget after the elections will portray the contours of a New India,” he said. Earlier in the day, PM Modi kicked off the Bharatiya Janata Party’s campaign in West Bengal for the upcoming Lok Sabha elections with a public rally in Thakurnagar. In a bid to woo the people, the Prime Minister said the people will not be required to pay any ‘syndicate tax’ and the money to the farmers will be directly paid to their bank accounts. 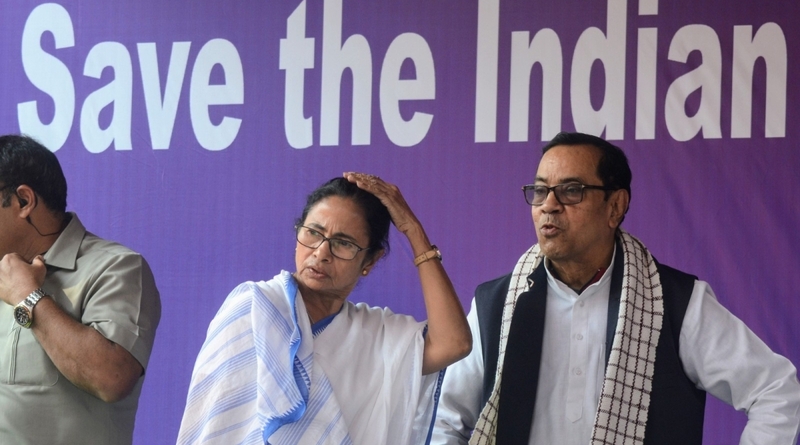 The rallies are being held at a time when the ruling Trinamool Congress in West Bengal has upped the ante against the BJP-headed government at the Centre and has given the call to oust the PM Modi government in the next General Election. Apart from PM Modi, Union Home Minister Rajnath Singh, Uttar Pradesh Chief Minister Yogi Adityanath and many other top leaders are also expected to attend several ‘Ganatantra Bachao’ rallies across the state. At a public event in Madurai on Sunday, the PM urged the youth of the southern state to reject the “forces of negativity”. Prime Minister Narendra Modi slammed the opposition parties in Tamil Nadu saying that they were busy creating an atmosphere of mistrust to serve their own interests. “It is unfortunate that an atmosphere of suspicion and mistrust is being created by a few people in Tamil Nadu, to serve their own selfish interests,” the PM said without taking any names in the presence of Tamil Nadu Chief Minister Edappadi K Palaniswami and Governor Banwarilal Purohit. “I urge all of you to remain vigilant against such negativity and call upon the people of Madurai, and the youth of Tamil Nadu, to reject the forces of negativity,” the PM added. The PM assured the people of the state that the 10 per cent reservation for upper castes will not impact Dalits, Tribals and OBCs, who are already availing benefits of reservation. “I want to talk to you about one more issue. This is relating to the Devendra Kula Vellalar community and ensuring justice as well as opportunities for them,” he said. “The issue came to me and I’m fully sensitive towards their demands,” Modi added, referring to the community’s demand to be excluded from the Scheduled Caste (SC) list. The PM said that the Union Government is taking effective steps to rid the country of corruption and nepotism. “Any person who has cheated or looted the country, shall be brought to justice,” he said. The Dravida Munnetra Kazhagam (DMK), the main opposition party in Tamil Nadu, has extended support to the ‘grand alliance’ which aims to take on the Bharatiya Janata Party (BJP) in the upcoming Lok Sabha elections in the country. DMK chief MK Stalin had on 19 January attended a mega anti-BJP rally in West Bengal on the invitation of the state’s Chief Minister, Mamata Banerjee. Stalin had then urged the people to vote BJP and PM Modi out of power. 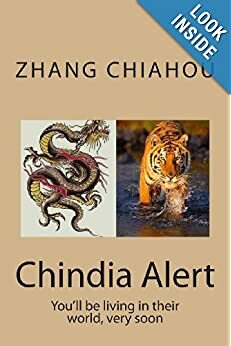 Reports say that the ruling All India Anna Dravida Munnetra Kazhagam (AIADMK) is apparently in talks with the BJP for an alliance ahead of the elections. Protests were organised against the Prime Minister in Madurai by opposition parties. MDMK chief Vaiko was seen leading a protest with black flags earlier today. The DMK, on the other hand, targeted the PM on social media. A Saravanan, DMK MLA, accused the PM of never offering any solace when Tamil Nadu was in distress. He said that the party is opposing the PM’s visit because of the majoritarian politics of the BJP. Before his address, the PM laid the foundation stone for an All India Institute of Medical Sciences (AIIMS) in Madurai and also inaugurated super speciality blocks at three medical colleges. The 750-bedded AIIMS will cost Rs 1,264 crore and is expected to go on stream in 2022. It will have a capacity of 100 MBBS seats and 60 for B.Sc. (Nursing). Speaking at the function, Palaniswami thanked PM Modi for setting up the AIIMS soon after the Centre had announced its plans to set up one in each state.